D.C. a Plantation, Congress its ‘Massuh?’ Councilman Explains. “They can treat us as their guinea pigs, they can treat us as a petri dish, and as I called it, they treat us as a colony or a plantation,” said Michael A. Brown, DC council member at-large. Brown was one of six council members arrested along with Mayor Vincent Gray at a protest fueled by anger at the federal government’s budget deal. “What’s next, we have to call them ‘massuh’?” said Brown. D.C. Councilman Michael A. 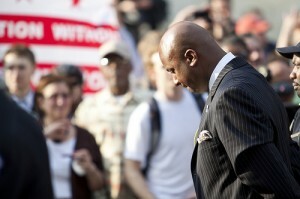 Brown was arrested April 11, along with other city officials, during a protest against the Congressional budget deal. The rhetoric surrounding D.C. statehood has been growing more and more heated in recent weeks, most notably with Delegate Eleanor Holmes Norton saying Congress’ budget actions were the equivalent of “bombing innocent civilians.” It also isn’t new to use the history and legacy of slavery power dynamics when talking about D.C. independence. In 2007, then-Mayor Adrian Fenty declared that D.C. Emancipation Day would be dedicated to “the continued pursuit for full democracy” with a voting rights march to the U.S. Capitol to demand representation in Congress.